Above all, the reason people liked Tommy was that he you knew exactly what you were dealing with. Here, everybody realized, was someone who was exactly, simply and totally who and what he seemed to be. But when Tommy turns up dead, Lennox and the rest of Glasgow will find out just how wrong they were. This is a superb, intelligent, atmospheric crime tale set against the blackened edifices of post-war Glasgow. Stylish and gritty, Russell offers readers a tartan take on the classic hard-boiled noir made famous by California writers like Chandler, Hammett, and Macdonald. And makes it his own. Although it's the fifth instalment in Russell's series starting Canadian soldier turned Glasgow 'Enquiry Agent' Lennox, THE QUIET DEATH OF THOMAS QUAID could comfortably be read and enjoyed by those brand new to this absolutely top-shelf series. It tells a compelling standalone tale, while also providing long-time readers with more insights into the battle-scarred Canadian. Lennox has never been afraid to deal in the grey area; he has his own moral code which doesn't always gel with others. He's a classic anti-hero, a knight errant operating in a corrupt world, trying not to fall prey, too much, to the griminess and violence that can surround him. But willing to cross some lines where necessary. In the past year, he's toned down the line-crossing, having partnered up with a former Glasgow policeman. The shingle now says Lennox and McClelland, Enquiry Agents. But his new partner probably wouldn't approve of a job Lennox gets from a Mr McNaught, a job that requires the burglary skills of one 'Quiet' Tommy Quaid. When it all goes horribly wrong, Tommy turns up dead and Lennox barely escapes, our (anti)hero is left wondering whether he's been set up. Feeling guilty, Lennox pounces on an opportunity from Tommy's sister for him to investigate the death. For free. 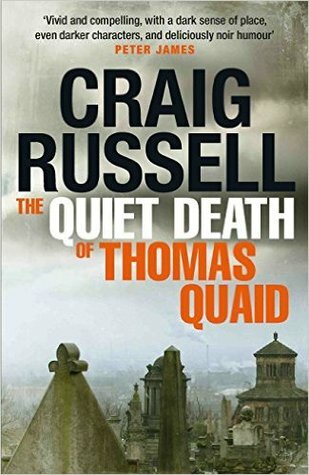 He discovers that there was much more to the seemingly amiable Tommy Quaid than met the eye, but Quaid was only one of many men hiding their true character behind a facade. Lennox is digging into very dangerous ground, a murky underworld of politics and power. Of secrets and cover-ups, a place filled with ruthless people willing to do anything to maintain their position. THE QUIET DEATH OF TOMMY QUAID is a terrific read, a compelling page-turner that provides a lot of depth and many thought-provoking themes along the way. 1950s Glasgow shimmers darkly from the pages, a changing city where all sorts of interests collide, out of sight of the general populace. Lennox is an engaging main character, complex and resourceful, who is easy to follow even down the most sordid of alleyways. He's flanked by an intriguing cast of supporting characters, memorable and at times larger than life. Glasgow crime kings, brutal enforcers, top cops. Each is more than they seem, and are brought to clear and compelling life by Russell. Reading a Lennox book is like pointing to the top shelf in a renowned whisky bar. You're in for something delicious, complex, and a little special.